We have just returned from another very successful showing at the Munich Hi-Society Show. We along with Alan Shaw of Harbeth and Bernd Homke of Input Audio, our distributor in Germany, entertained thousands of consumers and trade visitors to our display room. We once again featured Martina Schoener with her L’Art du Son turntable to wide acclaim. 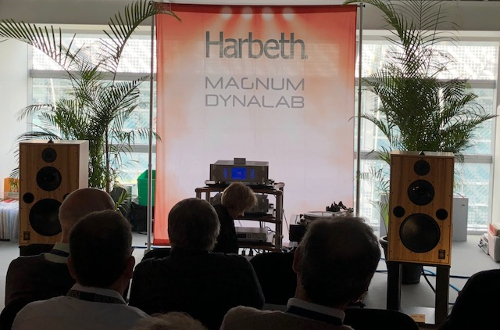 Magnum Dynalab demonstrated our MD309 integrated Hybrid Amplifier with our MD107T FM Tuner in conjunction with the very fine Harbeth 40.2 Anniversary Edition speakers. Once again we received many accolades and glowing reviews of our presentation. This is particularly rewarding since we don’t display a mega dollar system but one that is very real world accessible. We were also happy to show our new Magnum Dynamyte products and the concept for our new MDS800 series internet tuners and streamers. We would like to thank our many visitors for stopping in and our show partners and the many reviewers that congratulated us on the fine sounding system.